Given that we who choose to reenact the lives of French soldiers of 14-18 are products of our own time (and indeed for some, products of other reenacted eras), it seems useful to provide some basic guidance on how to achieve the appropriate "look" of the men we portray specific to their time. The following is intended to address a few points on the physical appearance of les fantassins in order to heighten the reenactor's overall impression. Facial hair continued to enjoy widespread popularity amongst Frenchmen (as indeed with many Europeans) in the 1910s and teens. This was particularly true within the military, where facial hair was equated with masculinity. This notion only grew in popularity when the common French infantryman was dubbed by an admiring public as poilu -- literally "hairy" though perhaps more accurately, "scruffy." 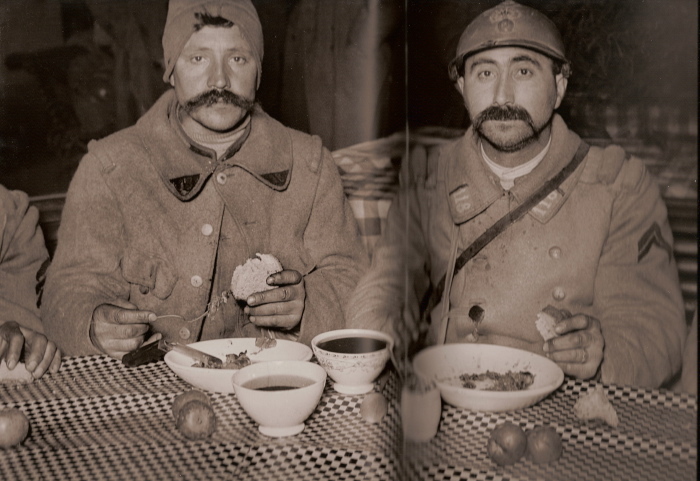 The single most common form of facial hair at the time of the Great War was the mustache. This was typically worn without any additional growth, the rest of the face being shaved. Lengths and shapes varied greatly, though two of the most popular styles were the handlebar or, on the opposite end, a thin closely-cropped upper lip stache. With handlebars the rule was the longer, the better. Wax was applied to keep the mustache in good form, though this was most likely a cosmetic luxury dispensed with when at the front where dust and mud unintentionally had the same effect. Handlebars -- some grown to conspicuous lengths -- were popular amongst all age levels and all classes of men, though younger men (perhaps by necessity) often gravitated toward a shorter style. Indeed, among the youngest cohorts who sported a one, a thin beginner mustache was typical, as evident from photographs. On a side note, it should be mentioned that the "pencil" mustache, made popular in the 1930s, was a style that had not yet become popular at the time. Though not as prevalent as the sole mustache, goatees and beards were also popular at the time. This is especially true among older men. Technically, beards were prohibited amongst the rank and file of the military. During the winter of 1914-15, as discipline slacked in tandem with the atrocious living conditions of the early trenches, many soldiers went without shaving for weeks. Deemed unhygienic and ill-suited when wearing a gas mask, regulations were adopted in the spring 1915 barring soldiers from growing beards and permitting only the presence of mustaches. Despite this, the appearance of goatees and beards can be found in the ranks through the entire war, albeit more often among the officers or the older reservists and territorials (the middle aged men). Despite the name, not all poilus grew facial hair. In fact, many French soldiers, particularly the younger ones, had no growth at all. These men shaved as regularly as conditions allowed (a period of sustained combat or routine drudgery might interrupt this hygienic habit). Nevertheless, the moniker "poilu" came to be applied to any infantryman serving at the front, be he mustachioed or not. As a final point, it should be noted that sideburns (either on their own or in accompaniment of a goatee) were definitively NOT in style by the time of the Great War, as is covered in greater detail below. Men’s hairstyles of the period were typically well-kempt, with the hair being either parted on the side or middle, or being combed back with no part. The hair was often kept longer on top than on the sides and back. Sideburns were cut higher than modern standards, with the hairline typically ending at a level equal to where the top of the ear joined the head (mutton chops or facial sideburns of any sort were a thing of the past). The same was also true of the back hairline, which was trimmed higher than even short-length modern hairlines. For styling, pomade was a commonly used product. In the military, regulations held that the hair on the sides and back of the head were to not exceed half an inch. All new recruits had their entire head cut down very short, resembling a modern buzz-cut. Hand clippers allowed for the hair to be closely trimmed (usually to an eight or a quarter inch in length). What we today refer to as a “high and tight” -- the ubiquitous fashion of the military serviceman -- originated in this period as well and was a common hair style. It should be noted that fading was not a cutting technique in practice at the time. Of course, circumstances in the field did not always permit the regs to be followed and hair length would often be worn longer (though still kept to a reasonable short length). The hair on top could be let to grow longer, though usually not exceeding 3-4 inches. Taking into account the information discussed above, the following guidance can be gleaned by those who portray the French soldier of the Great War. Hairstyles should be kept tidy, with care being paid to keep the sides and back to within 1 inch. The top can be kept longer. Sideburns should be avoided entirely. Facial hair, when grown, should also be well-kempt. Mustaches alone are highly encouraged. Goatees and even beards are also acceptable but should generally be kept relatively trimmed. Full beards in particular should generally be avoided by younger reenactors and by any reenactor portraying line infantry. Territorials are the exception.